“Richard, do I have a mark on my face? It really hurts,” Tommy asked. “Right here. Not here or here so much. Right here,” said Tommy. “I knew it!” Tommy exclaimed. 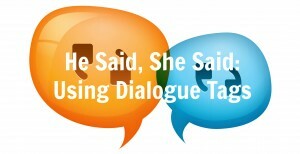 Dialogue tags are often necessary, but there is a great difference of opinion about how such tags are best used. Of course there’s nothing wrong with lists like this — in fact, I may create one of my own — but there’s another perspective on the use of dialogue tags that I think is worth mentioning. Frankly, I don’t like creative dialogue tags. I like them boring and inconspicuous. In most cases, I prefer said and asked — if any dialogue tag is necessary at all. I don’t want interesting, conspicuous dialogue tags because they tend to draw attention to the writer’s style rather than to what’s more important — the dialogue itself. The focus should be on the words being spoken. If the dialogue itself doesn’t communicate tone and emotion, it’s okay to give the reader some help with a descriptive dialogue tag like shrieked, sobbed, or boasted. Just try to stay out of the way. Don’t worry about using said or asked too much. If you only use them when they are necessary, and the conversation you are recording is interesting enough, no one will even notice them. Which is exactly the way it should be. Nothing. We’re okay. Go to sleep. We’re going to be okay, aren’t we Papa? Because we’re carrying the fire. This is a simple dialogue between a boy and his father. There are no dialogue tags at all (nor quotation marks), yet it’s perfectly clear who is doing the talking. Of course, I’m not suggesting that there’s only one right way to do this. It’s a matter of style. I certainly don’t recommend McCarthy’s stylistic avoidance of quotation marks. My preference is to use as few dialogue tags as possible, paying more attention to the words being spoken. When they are necessary, keep them simple unless some descriptive tag is really necessary. It’s really the showing not telling principle at work here. Allowing your dialogue to speak for itself is normally better than telling the reader how words were spoken via evocative dialogue tags. Make a blogger happy. Leave a comment below. and after too many repetitions they confuse themselves and suddenly start reversing their positions. Another issue is that I don’t see how you can go very long without dialogue tags if the conversation involves three or more people. However, I have been a big fan of the word ‘said’ since first grade. When I learned to read that word and could thus read dialogue for the first time, I began to find reading interesting. An issue I have with eliminating descriptive tags in preference to revamping the dialogue or adding action is that 1) it collides with reducing word count (along with banning adverbs), and 2) often interrupts the flow or intent of the dialog even worse than using a maligned descriptive verb. I agree that creative tags should be limited and are most useful in describing how something is said when dialog or flow would suffer with more ‘showing’, to include interjected tags between sentences or clauses. Descriptive verbs (and adverbs) exist in our vocabularly for a reason and shouldn’t be automatically smitten from our writing when they actually make more sense than bland/boring/common, especially when they reduce tedium and bloating (and, ahem, excessive profanity to show anger – guilty! ), as long as the meaning is clear and they are not used as a crutch for lazy writing. Today has been an epiphany for me. A search on how to properly punctuate dialogue and I found your wonderful article on how to “better” punctuate dialogue without overusing alternatives or modifying the way people talk with adverbs. Let the dialogue speak for itself. So glad I could help! Thanks for the note. “Said” and “asked” are definitely not boring and bland. In point of fact, when reading dialogue, the reader’s brain automatically interprets them as punctuation, and takes no notice. Any expert on dialogue will tell you that. On the other hand, non-standard dialogue tags (moaned, croaked, sneered, and others too numerous to mention) have the unintended consequence of knocking the reader out of the story, and that is NOT a good thing. You have only to read the best-selling Spenser novels of the late Robert B. Parker to understand this. Parker was a master at writing spare, elegant, and often eloquent dialogue, and he used “said” almost exclusively. He seldom even resorted to “asked,” even when a question was being posed. To me, novels in which non-standard tags outnumber said and asked, are unreadable. I enjoy reading your blog and would appreciate if you could add pin it button.